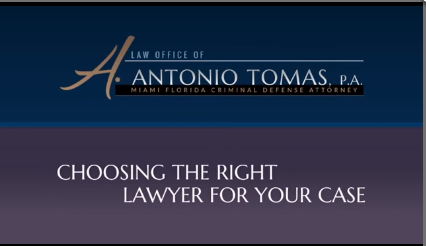 Miami Attorney | Law Office of A. Antonio Tomas, P.A. Tirelessly Defending The Rights of My Clients. Over 15 Years' Experience of Advocating for You. Are you looking for hard-hitting legal representation in the Miami-Dade or Broward County area? Dependable legal counsel can be hard to come be these days. 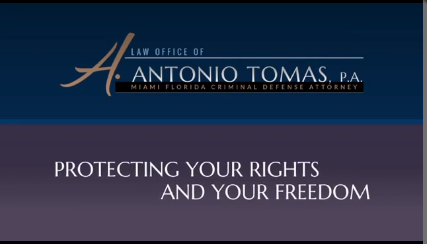 At the Law Office of A. Antonio Tomas, P.A., you will find assertive legal advocacy when you need it most. Whether you are facing a complex tax controversy or criminal charges, the Miami lawyer at the firm will tirelessly defend your rights in court. If your future is at stake, it is vital that you obtain an experienced attorney to preserve your best interest interests and to protect your rights against the IRS. Your choice of representation could mean the difference between freedom and incarceration. If you need help with a tax law or criminal defense issue, do not hesitate to speak with a Miami lawyer at our firm. We offer superior legal services, unmatched by any competitor. Our attorneys are highly respected and esteemed by peers and clients alike and seen as leaders in tax and criminal law. Our lead attorney, Antonio Tomas, has been selected for inclusion in the 2013-2016 lists of Super Lawyers® Rising Stars℠ in their Florida magazine. This high honor and recognition is only bestowed to the top 5% of attorneys in each state. Our firm currently holds a Superb Avvo Rating of 10.0, making Attorney Tomas the top tax and criminal defense attorney in the Miami area. We have also demonstrated a required level of excellence to receive an AV Preeminent® Rating by Martindale-Hubbell®. Tax law is an area of the law that can become extremley complicated because of its tie in with other forms of law. In addition, an experienced and successful tax attorney must now the code, forms, and protocols for any form of tax law that a client might need assistance with. Don't be a target for the IRS. Our attorney can assist you if you have been accused of evasion, fraud, or withholding taxes. Antonio Tomas is a Miami tax lawyer who has the knowledge and experience to negotiate with the IRS on your behalf and he can help fight to clear your name. Mr. Tomas can also provide aggressive IRS audit defense and tax collection defense in your time of need. Don't go to tax court without the proper legal protection, with the help of our firm, we can help build an effective strategy to resolve your tax issue. Finding the right attorney is an imperative part of your defense strategy. At the Law Office of A. Antonio Tomas, P.A, we believe that our team has the skill, qualifications, and experience to make a difference in the outcome of your case. If you were charged with a serious crime, your future, freedom, and reputation may be on the line. See how our Miami defense team can protect your rights. Facing a tax audit is never easy. 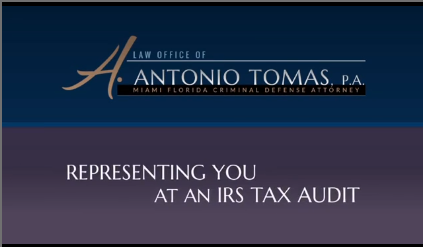 At the Law Office of A. Antonio Tomas, P.A., we take the time to know each of our clients’ cases, so they don’t have to worry about dealing with IRS officials. We are prepared to fully represent our tax clients, so call our Miami tax lawyer for a free consultation today.